Quebec’s Dave Clarke, Ellen Shizgal and Tod Gorr return to Folk Night. Striking original material and a fresh acoustic sound have made Steel Rail a favourite of fans and critics over the last two decades. The Quebec band’s three albums have received rave reviews. 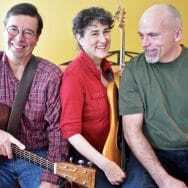 Dave, Ellen and Tod have also been acclaimed for their lush harmonies, Dave’s stellar picking – he’s been hailed as one of Canada’s best acoustic guitarists – and a sound that gets its sensibility from folk, and its soul from bluegrass and old-style country. Steel Rail played for us in March of 2007 in our very first Folk Night season. Welcome back. For more info visit Folk Night.